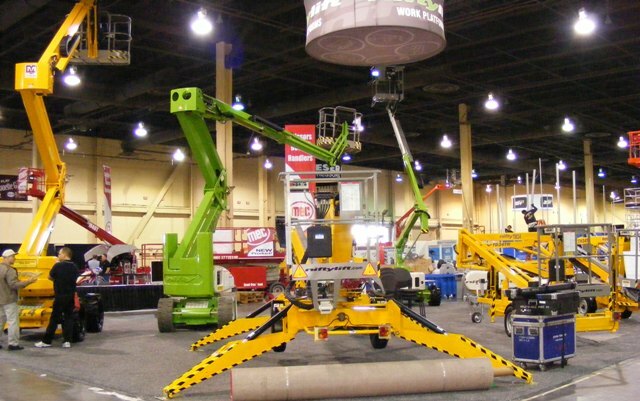 Manufacturers are increasingly offering attachments or workstations for aerial work platforms because of the added productivity they give to their users. Overhead work encompasses a multiplicity of activities such as welding, glazing, painting, wiring and maintenance, among many other tasks, and users need to take tools in the platform or use auxiliary power sources to perform these tasks. The attachments also help make overhead work significantly safer. They are making overhead work so much safer that they have been endorsed by the national safety training organization, Aerial Work Platform Training (AWPT). The simplest of the attachments are fluorescent tube caddies, pipe racks and specialized cradles for glass and panels that are installed on the platform’s rails. There are also a variety of tool trays for both scissor lifts and boom lifts which can include a vise, tool and parts holders, a 12-volt outlet to re-charge battery-operated hand tools and an electrician’s tree to hold wire spools. As Groat says, aerial work platform manufacturers are increasingly adding air and electrical lines routed through the boom to the platform with quick connects at the base. Compressors and generators can be attached to the machine at the base with outlets at the platform without the hazard of lines hanging down from the platform. There is a drawback when lines are routed through the boom with a separate generator or compressor at the base, however. Work must stop every time the aerial work platform is moved so that the ground-based equipment can be moved as well. To overcome the mobility problem, JLG, Skyjack and Genie have added generators integrated into the engine compartment and powered with a hydraulic or belt link to the engine. JLG also has an optional air compressor that can be installed in the engine compartment and is powered by the generator. It is available for its boom lifts and delivers 9.3 cfm of air at 125 psi. Genie also offers a 110V/60Hz inverter on all of its electric scissor lifts and an additional 230V/50Hz inverter choice on its two largest units, according to Eric Ludwig, Genie scissor lift product manager. On the combustion engine models, there is an optional 2,000-watt generator and for the largest rough-terrain models, there is also a welding option that includes a 12,500-watt generator with the welder. Skyjack also offers optional generators on its new boom lifts. There is a basic 3,500-watt model and a step-up option for a welder-ready machine that includes a 12,000-watt hydraulic generator with an oil cooler. For Skyjack’s electric-powered scissor lifts there is an optional 800-watt AC inverter and an optional shop airline to the platform. Skyjack’s rough-terrain scissor lifts also offer the shop airline, inverter and a 2,000-watt hydraulic generator. Since most customers have their own electric-powered hand tools, such as grinders, drills and saws, welders are the most common tool rented to utilize the built-in power sources and all three manufacturers have welding units to accompany their generators. Kurt Kropp, vice president of Kropp Equipment, a multi-branch aerial work platform rental house based in Schererville, IN, says that not only steel erectors use welders, but his company has a number of glaziers that use them to fasten mullions. The welders are in such demand that his company has generators suitable for powering the welders installed on 200 of the boom and scissor lifts in the fleet. When they are rented with a welder, there is a 10- to 20-percent premium in the monthly rental rate. He points out that with today’s fuel prices, another selling point for his customers is the economy of onboard generators and welders since there is no need have fuel to run a separate piece of equipment. Kropp also says that his company has not encountered any particular maintenance problems with the generators or welders, and since they are securely fastened to the frame, overnight theft from parked units has not been an issue. Besides powering welders and compressors, the generators incorporated into JLG and Genie machines can also power light towers to illuminate the work site. In the past few years, aerial work platforms have gone from machines that lift workers into the air to multi-tasking tools that optimize productivity in a safer environment. The net effect is that the new technologies are helping dealers become more profitable while providing better service to their customers — a win-win situation.